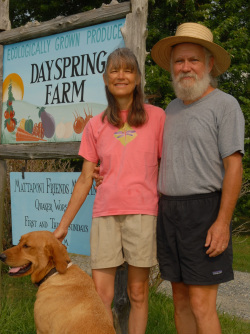 At Dayspring Farm, a bounty of fruits, vegetables and flowers greets each growing season. Savory squashes, leafy greens, heirloom tomatoes and juicy strawberries are grown in healthy soil using practices of natural fertilization and environmentally safe pest control. We are committed to sustainable agriculture, which treats the farm, the growers and the wider environment as a whole living system. Our aim is to keep the farm in harmony with nature, out of reverence for the land. Dayspring Farm is located in the beautiful countryside of King and Queen County, an area in Eastern Tidewater Virginia that continues to be primarily agriculturally based. The 18-acre farm is owned by Charlie and Miriam Maloney and their four children. The farm is also home to chickens, goats, cats, 2 horses, and a mixed breed dog named Bella. Today there is a growing call to create a different kind of food system that relies primarily on food grown locally. At Dayspring Farm, we are pleased to be a part of a renewal of small-scale farming.